We’ve previously had a glimpse of the new F30 3 series M Sport Package, but here in Detroit it’s sparkling brightly under the spot lights. Check out our photo gallery shot only minutes ago here at the North American International Auto Show. The package adds 18-inch or 19-inch lightweight wheels as an option. Included in the M Sport pack is an M-tuned suspension which lowers the car by ten millimeters and offers stiffer spring rates and damper settings as well as stronger stabilizer bars. BMW says the decision to include M Sport brakes as standard has yet to be determined. 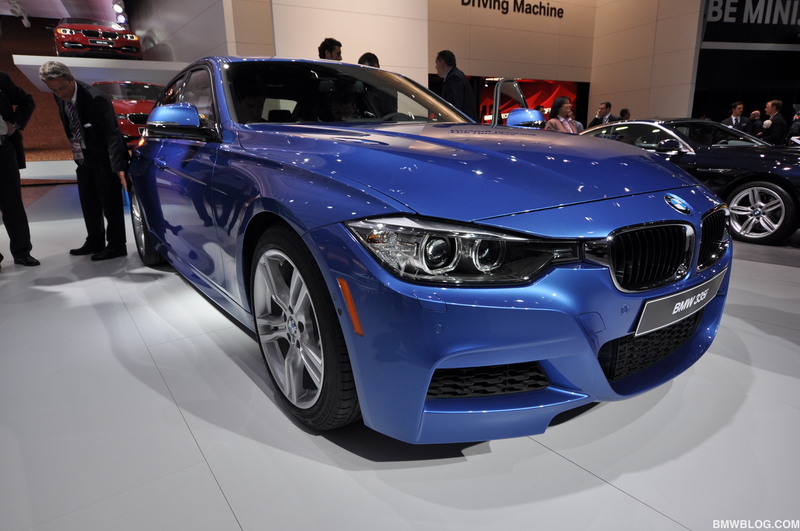 BMW Individual High-gloss Shadowline trim gives the car the typical M look. An optional M paint is also offered – Estoril Blue, as well as M Sport brakes with contrasting blue paint finish. Special aerodynamics cues, front and rear bumpers, sill covers in body color and a striking diffuser insert in Dark Shadow Metallic on the tail, and chromium exhaust pipe finishers underline the sporting character of the M Sport package. Inside, the M theme continues with sports seats boasting distinctive cloth/Alcantara upholstery, trim elements with blue accent strips, an M Short-shifter (in models with manual gearbox), M door sill finishers, an M driver’s footrest and the new M leather steering wheel. In addition, there are three further leather finishes. The decorative surface is designed in Aluminum Hexagon with blue accent trim strip. Contrary to our initial reports, now BMW says will offer the M Sport package in September 2012.